With Super Mario Bros., Nintendo had achieved a level of success that made their impressive arcade presence seem quaint by comparison. When it took on a life of its own, a sequel was inevitable. Both domestically and internationally, a game named Super Mario Bros. 2 surfaced in 1986 and 1988 respectively. The Japanese Super Mario Bros. 2, which would eventually be dubbed Super Mario Bros.: The Lost Levels in the West, was rejected by Nintendo of America both for being overly similar to the original and unreasonably difficult. This prompted Nintendo to create an easier Mario game for audiences abroad, which would also be repurposed mid-development as a promotional title for Fuji Television dubbed Dream Factory: Doki Doki Panic. Western enthusiasts at the time had little way of knowing that what they got was a different game reworked to include Mario characters. This in no way, shape, or form stopped the game released as Super Mario Bros. 2 in the West to become a success, eventually moving over ten million units. Meanwhile, shortly after the release of The Lost Levels in 1986, a ten-person team helmed by Takashi Tezuka known as Nintendo Entertainment Analysis and Development began work on a follow-up. Unlike The Lost Levels, which was considered by reviewers at the time to be frustratingly difficult, this new installment would welcome players of varying skill levels. Mr. Tezuka also wanted to overhaul everything from the characters’ sprites to their movesets. To this end, the programmers had what they called a “Map Room”. True to its name, it was a long, narrow meeting room in which they spent the entire day looking at sheet papers, programming map data. By the end of development, anywhere from twenty to thirty people worked on the game compared to the seven or eight who worked on the original. The game was slated for a domestic release in the Spring of 1988, but because the developers wanted to add many new features, Nintendo delayed it to the following October. Nintendo was willing to export the game to the West, but this plan quickly encountered a problem. 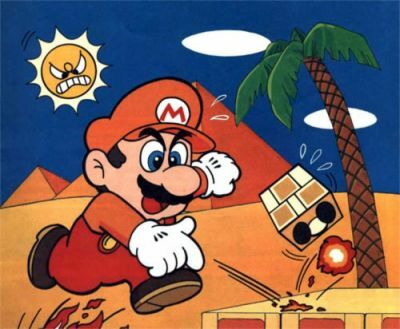 A shortage of ROM chips along with Nintendo’s preparation of the Western Super Mario Bros. 2 prevented them from exporting games such as Zelda II: The Adventure of Link to North America according to their original schedules. However, the delay proved to be a blessing in disguise. In 1989 as they were preparing to export the latest Mario game, Tom Pollack of Universal Studios approached Nintendo of America’s marketing department with an interesting proposition. Inspired by Nintendo game competitions, he wished to direct a film about them. Specifically, Mr. Pollack envisioned a video game version of Tommy, a famous rock opera released by The Who in 1969 about a deaf, blind, and mute child inexplicably skilled at pinball. Nintendo agreed to these terms, licensing their products to be included in this film. The film, released in December of 1989, would be known as The Wizard. The plot of the film can be summed up thusly. A boy named Jimmy Woods suffers from PTSD after the death of his twin sister two years prior. He is dead-set on going to California for unknown reasons and has been committed to a mental institute. This spurs his older brother, Corey to sneak Jimmy out and run away from home. After discovering his younger brother’s innate skill for video games, they travel to a tournament being held in Universal Studios Hollywood to compete for a grand prize of $50,000. Despite being panned by critics, The Wizard was a box office success, making double its budget back in ticket sales. Any enthusiast who watched the film could point out its myriad factual errors. Nonetheless, The Wizard would become a cult classic. Particularly memorable was the dramatic, climactic reveal of a game North American players had no idea existed until then. That game was none other than Super Mario Bros. 3. 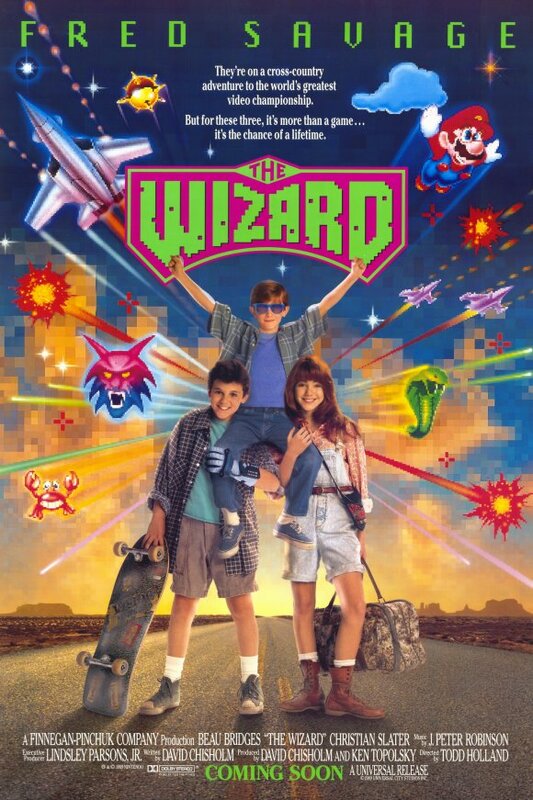 Nintendo had seen this film as the perfect opportunity to promote the newest Mario game and with the success of The Wizard, the enthusiasm could not have been greater. Two months later, those excited fans would get the opportunity to finally play it for themselves. The promotional campaign was a complete success, for Super Mario Bros. 3 went on to sell over seventeen-million copies worldwide. Even decades after the fact, critics considered Super Mario Bros. 3 one of the finest games ever made. With one of the most impressive legacies in the medium, does Super Mario Bros. 3 manage to stand on equal footing alongside the masterpieces it inspired? The Mushroom World has been invaded by the Koopalings, King Bowser’s seven children. They have conquered each of the world’s seven kingdoms, stealing the magical wand from their monarchs. In their wake, they have transformed each of these kings into animals. In response, Princess Peach has tasked Mario and Luigi with journeying to the seven kingdoms so they can retrieve the stolen wands and restore the kings’ true forms. Immediately after starting the game, one big difference between Super Mario Bros. 3 and its predecessors reveals itself. While you were thrown right into the thick of things upon pressing the “START” button or, in the case of both versions of Super Mario Bros. 2, selecting a character, Super Mario Bros. 3 takes you to what is known as the world map. Whether one called it the world map or the overworld, the basic concept behind this screen was familiar to those versed in role-playing games. To simulate the feel of a long journey while effectively cutting out the uninteresting portions, world maps connected important areas with vast expanses of land. However, the world map in Super Mario Bros. 3 is greatly simplified compared to a typical example. Mario can only travel using the paved roads and there are no random encounters. Intuitively, Mario begins on the tile labeled “START”. His goal is to reach the large castle in the bottom-right corner of the screen and respond to the retainer’s cry for help. The numbered tiles represent the stages. Because Mario cannot pass a stage that has not been cleared, your first course of action is to guide him to first one and press the “A” button to enter it. 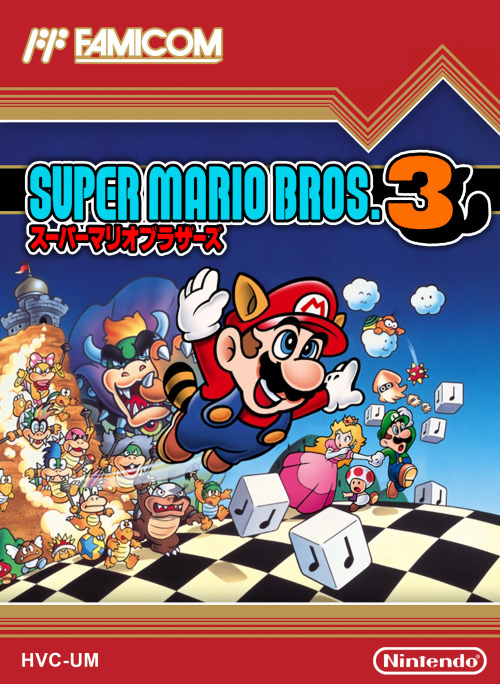 The team originally wanted Super Mario Bros. 3 to be played from an isometric view, but abandoned the concept when it made jumping on enemies difficult to gauge – the checkered floor seen in the introduction being a remnant from this idea. As such, after experimenting in the Western Super Mario Bros. 2, Super Mario Bros. 3 returns to a style reminiscent of the original game. Being quite the acrobatic protagonist, Mario’s primary method of defending himself is by jumping and subsequently stomping on enemies. As usual, jumping is carried out by pressing the “A” button. One still can make Mario run by holding down the “B” button as he moves. One major difference is that the momentum Mario builds is now measured by a meter, which is prominently featured on the interface on the bottom of the screen. As he builds up speed, the arrows light up until the meter reaches the oval with the letter “P”. The ensuing sound effect that plays indicates Mario is running at top speed. He can remain at this speed indefinitely until you either hit an obstacle or slow down manually. The health meter is eschewed in favor of the original’s power-up system. 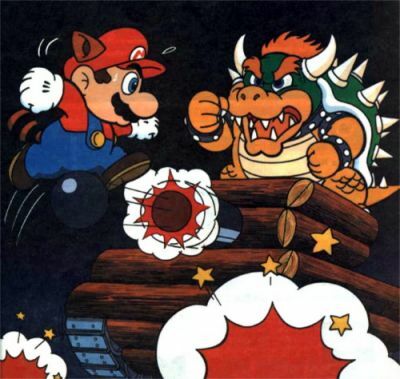 From the onset, a single collision with an enemy or other hazard is enough to put Mario out of commission. 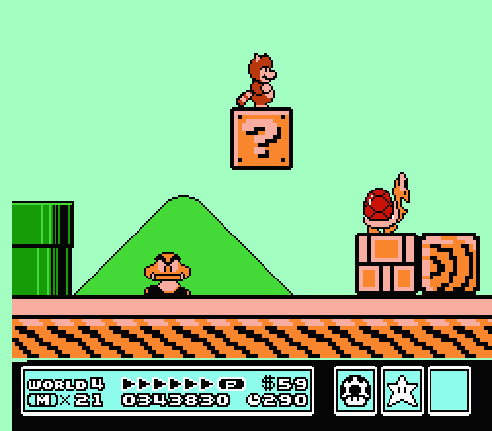 By striking blocks with question marks printed on them, Mario can potentially uncover a Super Mushroom. Once he does, it begins moving in the opposite direction from which Mario hit the block. By consuming it, he doubles in size and becomes Super Mario. Super Mario’s utility extends beyond merely being able to take a hit without dying; he can break golden, flashing bricks by punching them from below. In this game, Mario new ways to defend himself. He can now take advantage of uneven natural terrain by sliding down slopes. This is accomplished by holding down on the control pad while on a slope. This maneuver defeats most enemies unfortunate enough to be in his path. In addition, not unlike Super Mario Bros. 2, Mario can pick up certain objects and throw them at enemies. He can even pick up Koopa Troopas in such a fashion. All he has to do is hit them once so they retreat into their shells. From there, if the player holds down the “B” button while approaching them, Mario will pick them up. After launching a Koopa in such a fashion, it will travel forward at a blinding speed until it hits an obstacle or falls into a bottomless pit. Because you obviously can’t hit a question mark block or break a brick on the ground, this is one of the primary methods of uncovering its contents in such a situation. You must take caution because it will damage Mario if he is in its path. In addition, because you technically didn’t defeat the Koopa, it’s only a matter of time before it rights itself. If it begins wiggling, it’s close to escaping from Mario’s grasp. If you wait too long, it will break free, damaging Mario in the process. 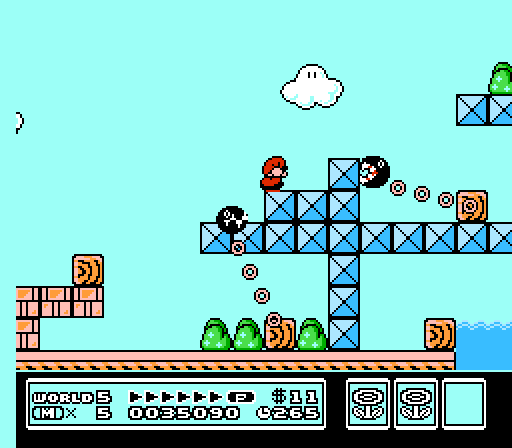 The power-up system deviates slightly from the original game if Super Mario is fortunate enough to find a block that would have contained a mushroom otherwise. Should he do so, he may uncover the familiar Fire Flower. Unlike the Super Mushroom, the Fire Flower remains rooted to the spot on which it spawns. 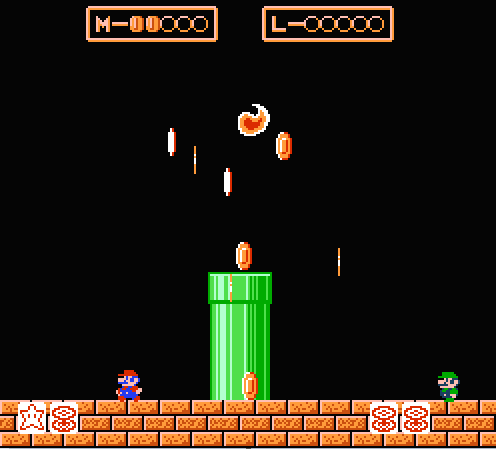 This power-up functions exactly as it did in Super Mario Bros. After becoming Fire Mario, players can use the “B” button to shoot fireballs, which bounce in small arcs along the ground. Given that Mario cannot touch certain enemies under normal circumstances without taking damage, the fireballs can potentially turn the tides when he is navigating certain areas. This isn’t the only power-up Super Mario can discover, however. If he’s particularly lucky, he may find a Super Leaf. 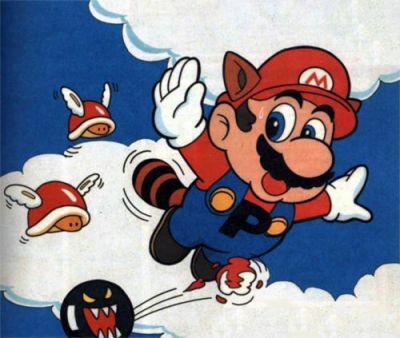 If Mario grabs the leaf as it descends in a fairly realistic manner, he becomes Raccoon Mario. This form has him sprout a tail and his hat is even adorned with raccoon ears. By running at top speed, he can leap and fly in the air for a short duration of time. As he begins his inevitable descent, you can keep pressing the “A” button to slow it down. In addition, by pressing the “B” button while on the ground, Mario can smack an enemy with his tail. Like the fireballs, this technique can damage enemies Mario wouldn’t normally be able to touch. It can be used to shatter bricks or uncover the contents of a question mark block from the side, which is useful if either is on the ground. Although Super Mario Bros. 3 is clearly modeled after the original, it does manage to take a few cues from the game released in the West as Super Mario Bros. 2. This is the most apparent when you fly in the air as Raccoon Mario for the first time. As Mario soars through the air, the screen scrolls up with him. This is notable because Super Mario Bros. and its first sequel could only scroll horizontally. While its alternate sequel featured vertically scrolling stages, this property was fixed depending on the screen. That is to say, an area could scroll vertically or horizontally, but not both simultaneously. The very first stage of Super Mario Bros. 3 showcases its superior mapping capabilities. In fact, given the limitations of the original game, Super Mario Bros. 3 appears to defy the console’s hardware specifications. This is because the cartridge utilizes a custom-made MMC3 (memory management controller) ASIC to enhance the capabilities of the NES. This is what allows the game to scroll diagonally. The chip also allowed the programmers to animate the tiles as well as split the screens with a scan line timer. The latter was how they implemented the static status bar on the bottom of the screen while animating the playing field on the top portion. While a goal in Super Mario Bros. was represented by a flagpole, a flashing card awaits Mario at the end of a standard stage in Super Mario Bros. 3. Depending on his timing, he will receive a card with a mushroom, flower, or star printed upon it. If he collects three cards, he receives one extra life. His reward will be far greater if the cards all match. Respectively, three matching cards will grant him two, three, or five extra lives. 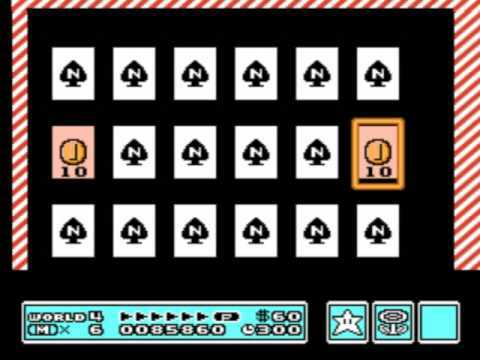 As the roulette is fixed depending on when Mario enters the dark backdrop, it’s easy to gain three star cards if he runs into it from a forty-five degree angle from the left at full speed. Even if the trick is unsuccessful, being granted an extra life upon completing three standard stages is a nice, little bonus. Completing a stage causes its respective tile to flip over, revealing an “M”. In this state, they cannot be reentered, but the player can pass through them freely. Clearing a stage sets up a temporary save point for Mario. In the event that he loses a life, he will be sent back this point. A new checkpoint is set up whenever he navigates an overworld pipe system as well. Though Super Mario Bros. 3 features infinite continues, there is a penalty for losing all of your lives. 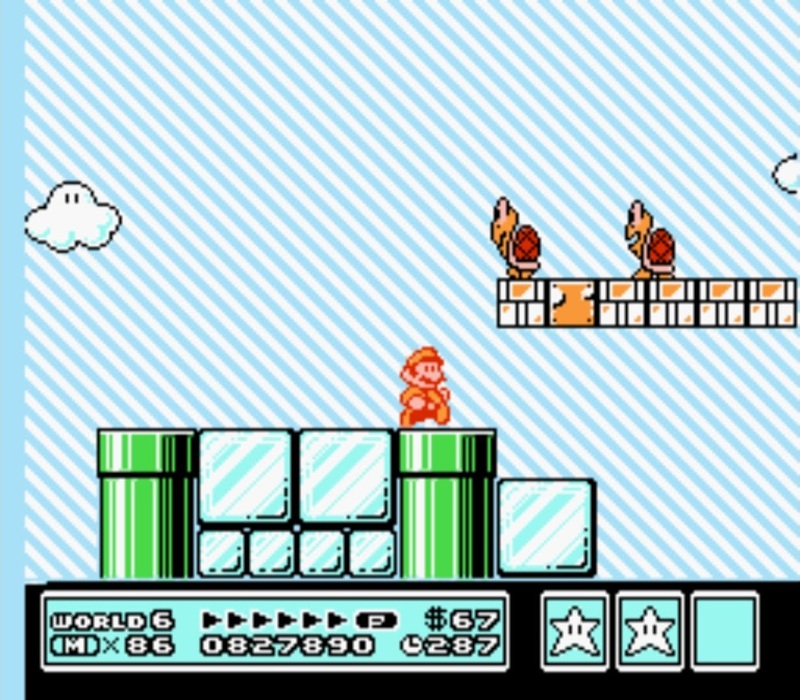 Should you ever encounter such a situation, the game will send Mario back to the “START” tile. In the process, all of the levels he has cleared will revert to their default state, necessitating the player to clear them a second time. This doesn’t necessarily mean that you will have to start entire worlds from the beginning every single time you lose all of your lives, however. 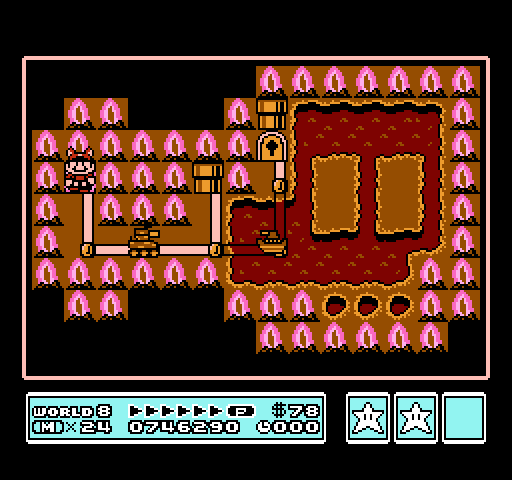 Among the standard, numbered levels are small fortresses housing Bowser’s evil minions. These stages are usually more labyrinthine in design, often featuring doors and multiple paths. At the end of each of these stages is a Boom Boom. These powerful Koopas make up the elite forces of Bowser’s army. They are quite fast, being able to leap across the screen in a single bound. Though defeating them is a simple matter of jumping on their heads three times, the task is often easier said than done. Seconds after landing the first blow, the Boom Boom will raise a shield of spikes from its shell. This is to prevent Mario from hitting it multiple times in a row, though it can be bypassed if he opts to lob fireballs at it instead. Fighting Boom Booms brings to mind how Super Mario Bros. 2 handled its own reoccurring boss, Birdo. This is because the fights are all fundamentally the same, yet are made more difficult in subtle ways. Later Boom Booms are capable of flying after being struck the first time. In addition, the arena itself is occasionally tailor-made to give Mario a distinct disadvantage whether it’s by replacing the floor with a conveyor belt or placing platforms in strategic locations to make jumping on them more difficult. When you fell a Boom Boom, it drops an orb bearing a question mark. Collecting it not only ends the stage, it also causes the map to change slightly. In the case of the first fortress, the orb will cause the locked door to the right of the “START” tile to disappear. It’s best to think of these orbs as checkpoints, for in the event that you expend all of your lives, any door unlocked or other environmental change caused by collecting them will remain for the duration of your playthrough. Things get interesting should the player decide to explore the other landmarks. In the first world, the fortress can be reached as soon as the player completes the second stage. 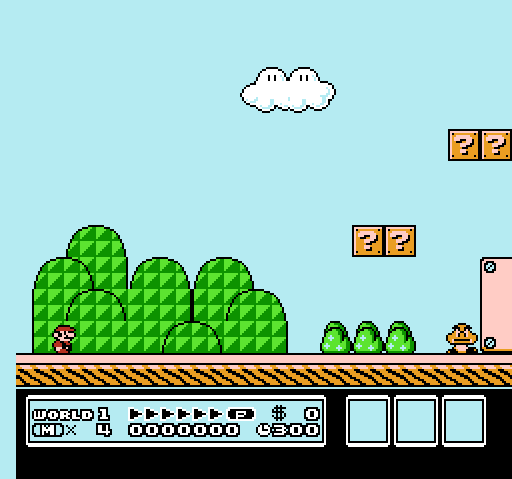 If level progression worked as it did in Super Mario Bros., the player would have to go through the third and fourth stages as well. As it stands, the player can take the pragmatic option by skipping both. Though neither level is strictly necessary to complete, there is an advantage to travelling off the beaten path. Said advantage lies within the mushroom-shaped house between the two stages. These houses belong to a Toad or a Mushroom Kingdom denizen, who will gladly help Mario on his quest by giving him one of three items. The inventory screen is accessed by pressing “SELECT” on the world map. The highlighted item will be used if the player presses the “A” button. 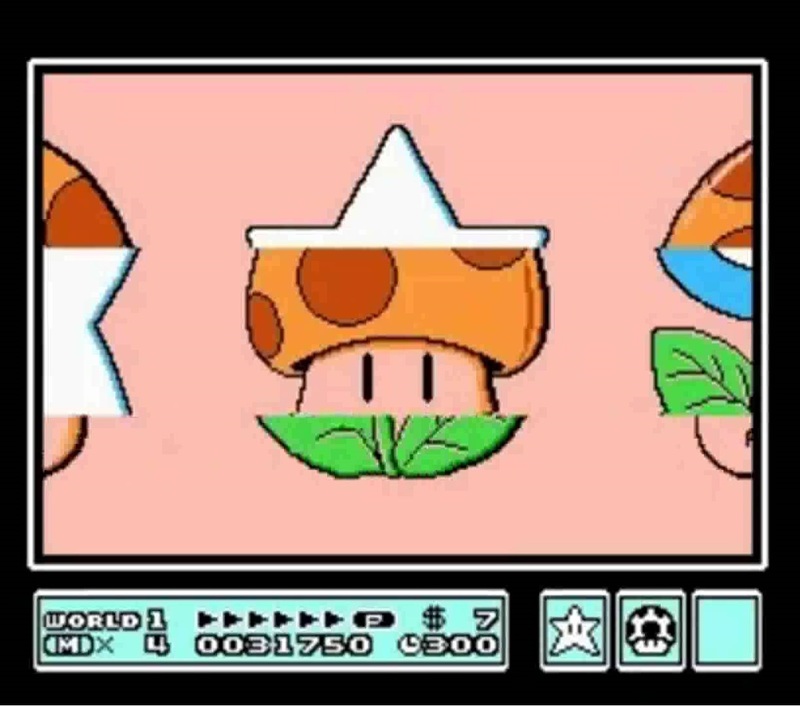 Any of the power-ups Mario can find in a stage can be given to him by a Toad – including the Super Star. Certain ones are exclusively found in these houses. There are also items that can only be used on the world map. One such item is the hammer, which is used to remove large boulders blocking access to certain paths. The tile bearing a spade symbol allows the player to partake in a minigame. The object is simple – three sections of this picture are in motion until the player presses the “A” button. If the picture is lined up perfectly, it will form a mushroom, flower, or star. The player will then be awarded the number of lives associated with each symbol. Intuitively, they are the same values assigned to the cards obtained at the end of standard stages, though you will not receive a consolation prize if your timing is off. There is another reward awaiting players for every increment of 80,000 points they obtain. When they surpass the threshold, a floating Spade Panel bearing the letter “N” appears on the second-most recently cleared stage. If the player visits the panel, they will be taken to a memory minigame. There are eighteen cards on the table, and you choose two to flip. If they match, you will obtain the item printed on the card. You play the game until you obtain all the prizes or make two mistakes. The matching cards remain flipped upon reentering the game after losing. Once all of the cards are flipped, they are shuffled and reset for the next session. Another look at the map reveals that there is another major obstacle standing between Mario and the king’s castle – a mobile one, in fact. While Super Mario Bros. took its time introducing the Hammer Brother, being a difficult foe to dispatch when ill-prepared, Super Mario Bros. 3 has one patrolling the area around the first castle. This serves two purposes. The most obvious is that it allows players to come up with a strategy for defeating them. On a more esoteric level, the game uses this development to broadcast that the original was child’s play by pitting you against one almost immediately. Upon clearing a stage, the Hammer Brother will move from its current position. It can only occupy a featureless point of a given world, but if you guide Mario to its location, you will be forced to fight it automatically. Though this may seem like unnecessary padding, fighting them is usually beneficial. This is because Hammer Brothers drop chests upon defeat. 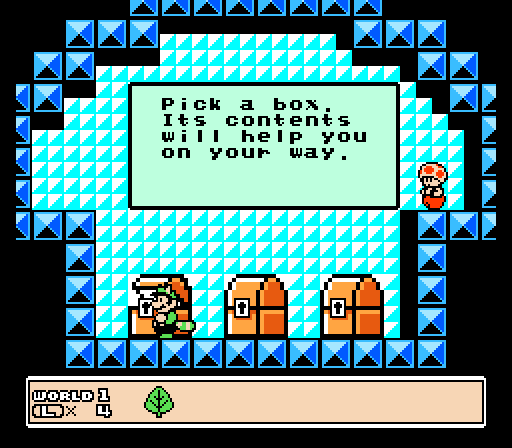 The items within these chests tend to be far more valuable than the ones given to Mario in the Toad Houses, so fighting them could very well be worth the risk. When Mario finally reaches the castle, he is informed by the king’s retainer of their plight. In order to restore the king to his true form, Mario must defeat the Koopaling who has pilfered the magic wand. Each Koopaling commands an airship. These stages are distinct from a standard one in that they scroll automatically. The pacing of the stage is set and cannot be sped up, so does not matter how far close to the edge of the screen Mario moves. In fact, such a tactic is all but guaranteed to result in him walking into a hazard or enemy and is therefore inadvisable. Airships contain unique hazards, including moles throwing wrenches, cannons, and rocket engines shooting jets of flame. 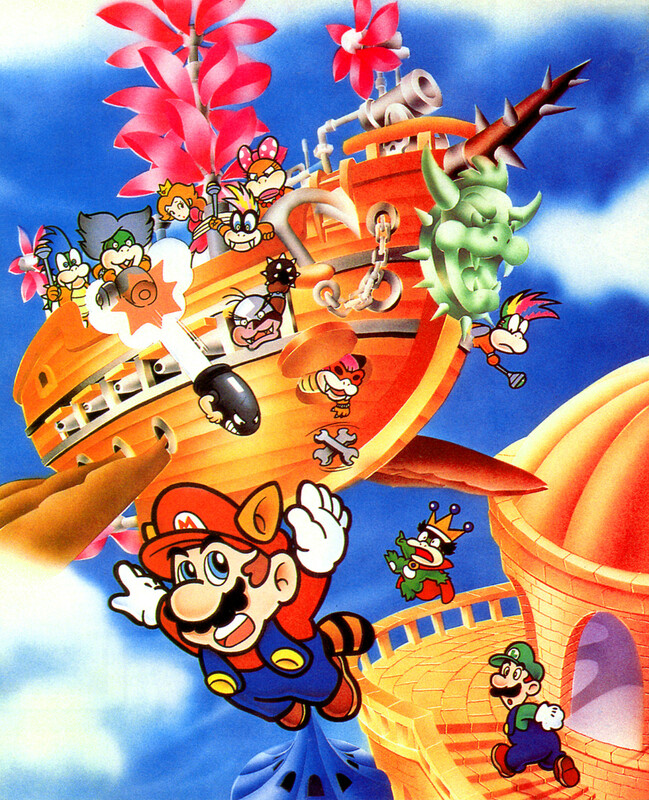 Koopalings are found within the airship’s interior, which is entered via a silver pipe. Much like the Boom Booms, they are markedly more difficult than standard enemies, requiring three stomps to vanquish. They differ from Boom Booms in that they bounce around when struck. 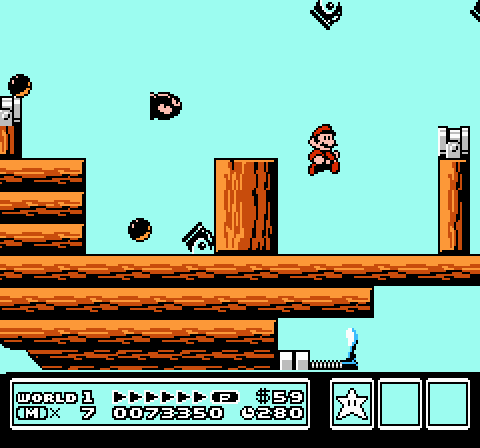 Though Mario only takes damage if from their bouncing around the room if he is struck from above or the side, the attack is much more difficult to avoid than the Boom Booms’ spike barrier. More pressingly, all of the Koopalings have a ranged attack thanks to the wands they carry. Finally, like the Boom Booms, players must properly assess the arena itself to have any success. Though you won’t find any platforms hovering in midair, the floor is almost always uneven, making it easy for the Koopaling to get the drop on Mario if he is in one of the divots. In the event that you lose a life in these stages, the airship will depart from the castle, taking up residence on an unoccupied space on the map. Though it’s possible to clear the fewest number of stages possible to reach the castle, such a proposition only realistically works if the player is capable defeating the Koopaling on their first try. If they fail, the airship could very easily end up on an unreachable space, requiring the player to clear any stage blocking access to it. Thankfully, the airship does not move upon completing a stage; only losing a life while on it will cause it to relocate itself. Defeating the Koopaling allows Mario to recover the king’s magical wand, restoring the latter to his true form. Shortly thereafter, he will receive a letter from Princess Peach. These letters contain helpful pieces of advice that either unlock extra content when followed or allude to obstacles Mario may face in the foreseeable future. Admittedly, owing to the stilted translation, these clues can be a little cryptic. Luckily, these letters also contain valuable items that will help Mario on his journey. The first such item he can receive is the P-Wing. This wondrous charm transforms Mario into his Raccoon form and permanently maximizes the Power Meter. In short, this allows Mario to fly indefinitely. Needless to say, this completely trivializes certain stages, though it’s inadvisable to use it with impunity because they are difficult to come by. This facet was one of many that allowed Super Mario Bros. 3 to stand out from nearly every single platforming game of its day. One would be hard-pressed to find a contemporary effort that placed such an emphasis on resource management. Mega Man gave its title character new weapons upon vanquishing the boss of a standard stage that had limited ammunition, yet there wasn’t as a pressing of a need to conserve energy. This is because a savvy player could find ways to refill ammunition for these weapons. If worst came to worst, a player could sacrifice their score and purposely lose all of their lives to refill their weapons’ energy. In Super Mario Bros. 3, these valuable items are gone for good when used. It therefore impresses upon the player to manage their resources wisely by encouraging them to think in the long term. Using a P-Wing in a difficult stage may sound appealing, but if a worse situation presents itself, the player may find themselves unable to proceed. It was exceptionally rare to see this kind of skill exercised outside of a role-playing game in 1988. By implementing this kind of thinking to what is generally considered a simpler genre, it showcased the medium’s latent potential to a mass audience. Super Mario Bros. 2 was the first game in the series to have worlds with unifying themes. In addition to the standard grassy plains, Mario and company traversed deserts, the sky, and a snowy tundra. While this lent Subcon a greater amount of personality than the Mushroom Kingdom, Super Mario Bros. 3 goes further with the idea. 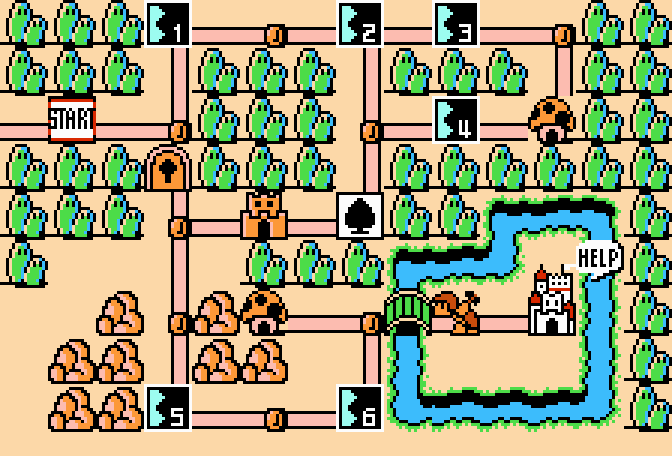 The Mushroom Kingdom as it is in Super Mario Bros. 3 is divided into seven regions with distinct themes: Grass Land, Desert Hill, Ocean Side, Big Island, The Sky, Iced Land, and Pipe Maze. Though its predecessor experimented with the idea, Super Mario Bros. 3 actively incorporates the identity of these regions into its level design. Grass Land, much like World 1 of Super Mario Bros., provides a light sampling of what to expect in the future. By the time you obtain the magic wand, you will have encountered multiple standard stages, an underground area, and potentially two levels that scroll automatically. Desert Hill is the first world in which the world’s identity begins having a discernable effect on the stage design. Mario will be made to leap over pits of quicksand, which can be escaped by repeatedly pressing the “A” button. 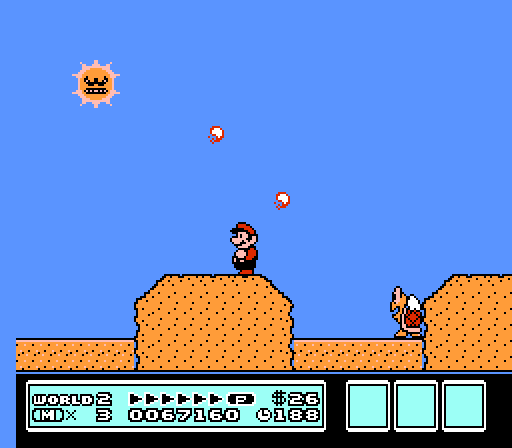 It even simulates the typically harsh desert environment in one stage by having Mario avoid an enemy shaped like the sun. 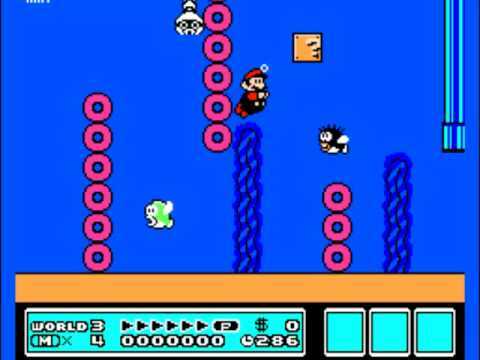 Ocean Side showcases how differently water stages function in Super Mario Bros. 3. Specifically, bodies of water now have actual surfaces to them; the developers didn’t merely alter the physics engine and apply those changes to an entire stage. Big Island features what is perhaps the most popular gimmick in the game. True to its name, nearly all of the enemies in this world are giant. Even the ground and bricks are drawn in larger proportions, emphasizing how small Mario is in this world. The Sky primarily consists of levels hanging over an infinite void. They bring to mind the athletic stages found in the original game. Iced Land, as one would expect, is a world covered in snow. Much like in Super Mario Bros. 2, this means there is significantly less friction on most platforms, forcing players to time their jumps carefully. Finally, Pipe Maze’s name is highly fitting. Half of the challenge is finding the correct path through the world by navigating the titular travel system. The other half is within the stages, which themselves often have a mazelike quality to them, rewarding careful observation more than mindless running around. Though many of these aspects by themselves demonstrate the sheer amount of improvements Super Mario Bros. 3 makes over the original, it also deserves credit for providing a superior multiplayer experience. Though many great things could and can still be said about Super Mario Bros., it was ultimately not a two-player game at heart. There did exist two-player option, but it was a nominal feature at best. 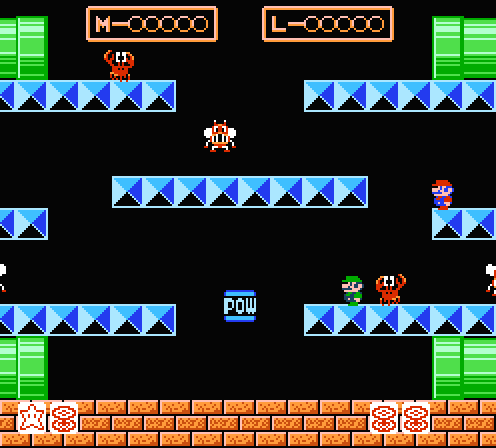 Unlike Mario Bros. in which players cooperated to fight the enemies, Super Mario Bros. had each player go through the same single-player game. This premise didn’t work in practice because only when one player lost a life was control of the game relinquished to the other. As long as one player kept clearing stages, they could keep going. Theoretically, the second player could watch their friend clear the entire game before they got a chance to play. Consequently, two-player sessions only realistically worked if both players were inexperienced at the game so the time spent waiting wouldn’t be too long. Though this may have been true in 1985, as players would become more skilled at video games in general, the two-player option in Super Mario Bros. became a recipe for disaster. This is likely the reason why neither version of Super Mario Bros. 2 bothered to include a multiplayer option. Given that making a cooperative game out of Super Mario Bros. wasn’t realistically feasible with the NES’s hardware limitations, Mr. Tezuka and his team provided the perfect solution: they turned Super Mario Bros. 3 into an electronic board game. The board in question happens to be the world map. When the game begins, the first player is allowed one attempt at completing the first stage. If they succeed, Mario’s counter is placed on the now-cleared number tile. Should they fail, they will be sent back to the “START” tile. Regardless of the outcome, control of the game is passed to the second player. A flipped stage tile can be passed no matter who cleared it. A savvy person may have taken note of this and realize that the second player has a chance to steal the fruits of their labor by visiting the Spade Panel or Toad House lying beyond the stage they just cleared. This would be especially infuriating given that visiting either location will not cost a player their turn. Fortunately, this person is not out of luck. Should Mario or Luigi pass over the counter bearing the other brother’s letter, the respective player can use the short window to press the “A” button. If they timed it right, the two players will may be placed in an arena similar to the playing field in Mario Bros. Alternatively, if the player in control is feeling particularly audacious, they can instigate the minigame themselves. 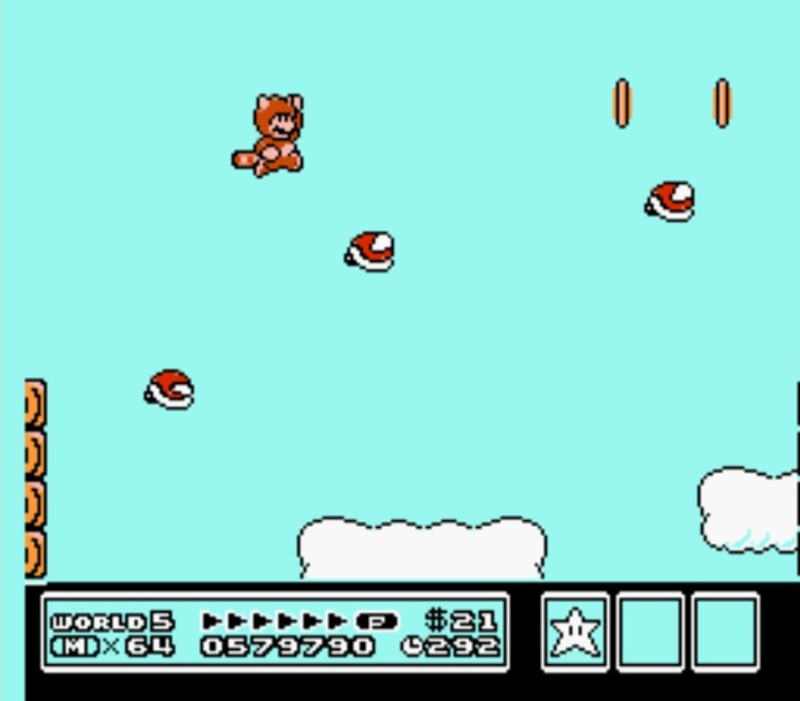 In either event, the minigame inspired by Mario Bros. has one of two goals. The first, like the original arcade game, involves defeating the enemies. To do so, a player must hit the ground they stand on from below. The crablike sidesteppers require two hits to successfully stun; the first blow only agitates them. If a stunned enemy recovers, they will recover and begin moving faster. Whoever defeats three of the five enemies is declared the winner. The second variation involves collecting the five coins. Straightforwardly enough, the one who collects three or more coins wins. Just like in Mario Bros., fireballs appear from the sides of the screen if the players take too long. There are two more battle mode variants in addition to the ones inspired by Mario Bros. The third involves collecting coins erupting from a pipe. Whoever collects five coins is the winner. Fireballs also emanate from the pipe, so the players must be careful not to get burned. The last minigame places Mario and Luigi in a room with several question mark blocks. Each player must stand next to stand next to a block and press the “B” button to reveal its contents. Five of them have coins and the player who has collected three or more is declared the winner. These minigames present myriad opportunities for an impish player to antagonize their friend. If either player dies during a minigame, they lose their turn. This means attempting to push your friend’s character into an enemy or stun them with the POW block thereby achieving the same result is a perfectly viable tactic. Even worse, by bumping the other character from below, you will dislodge one of their goal cards. In a clever touch, the cards travel in the same way as the power-ups printed on them. The mushroom cards move forward, the flower cards stay rooted to the spot, and the star cards bounce along the ground. It’s possible for the robbed player to recover their card, but they disappear if their opponent collects three of them, so it’s best for them to exercise caution if they already carry two. Though it may seem like absolute anarchy, it’s actually a very effective blend of competitive and cooperative gameplay. Continuously entering the minigame to gain an advantage may sound like a good idea on the surface, but it’s ultimately unproductive, dragging the session out far longer than necessary. Because players do not lose lives when killed in Battle Mode, it’s pointless to defeat them repeatedly – especially if neither side is obtaining any new goal cards. As a result, players will eventually have to set aside the desire to achieve a higher score in favor of clearing the stages as usual. Although Super Mario Bros. 3 is an unequivocal improvement over its predecessors, it has its own share of problems. It does stand to reason that this installment would bear signs of growing pains given the level of ambition present. For example, one of the more curious aspects of the levels in Super Mario Bros. 3 is that they have no checkpoints. Given the nature of the game’s multiplayer component, this is somewhat understandable. In Super Mario Bros., it wasn’t an issue because each player had a separate campaign. They merely picked up where they left off when granted control of the game. Because it’s up to one of the players to clear a stage in Super Mario Bros. 3, featuring checkpoints would be seen as an unfair advantage – even if they had to work to achieve it. This aspect is also excusable in that the levels in Super Mario Bros. 3 aren’t quite as intricately designed as those from Super Mario Bros. 2. It could lead one to conclude that the programmers went for quantity over quality, but I ultimately think of the design as a compromise between series’ first installments. All in all, the lack of checkpoints isn’t debilitating because very few stages are long enough to warrant them. Nonetheless, it does lead a fair bit of frustration should you lose to a boss, as it ensure you must complete the entire level again for another chance. Less forgivable is that one cannot save the game. With Super Mario Bros. 3 being such a massive step forward for the series, it seems unfathomable in hindsight that Nintendo would not include such a function. Depending on what the player does, a playthrough of Super Mario Bros. 3 could take several hours. It is mitigated in how one is granted infinite continues with which to complete the game, but it doesn’t change that once you start your playthrough, you are committed to it until you win or turn off the console. It wasn’t uncommon for players back in 1988 to get around this by leaving the console on overnight. This wasn’t an ideal solution, however. Any stroke of bad luck, which could take the form of an errant power surge, accidently bumping the console, or a mechanical error, would render the game unplayable, thus invalidating a player’s progress. The worst symptom of the Mario franchise’s rapid growth is evident in its array of game-breaking glitches. 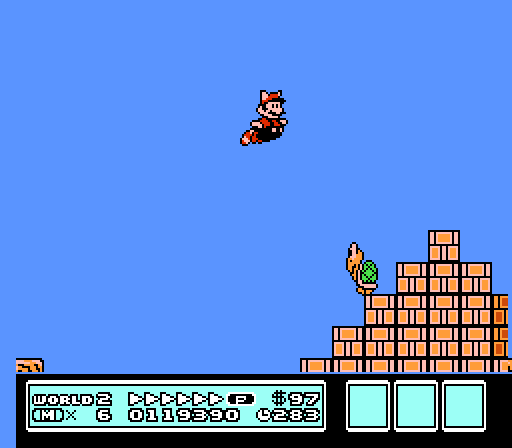 Anyone truly familiar with Super Mario Bros. 3 can attest to a particularly fatal glitch present in World 5, The Sky. In the event that a player cannot defeat the Koopaling, there is a chance the airship will fly off the map. This makes any further progress impossible. In light of how late in the game this occurs, it is immensely frustrating, rendering all of the effort spent to reach that point worthless. It could be averted if the player happens to have a Warp Whistle or Anchor on hand. The whistle takes the player to the Warp Zone, giving them a choice of up to three worlds to visit. Upon being used, the Anchor prevents the airship from moving. This isn’t likely because anyone attempting to get the Warp Whistle would skip the fifth world. Meanwhile, receiving an Anchor involves such an involved, convoluted process that one could go entire playthroughs without ever seeing it. Even then, using the Anchor is typically a catch-22. A player skilled or knowledgeable enough to obtain it can usually clear any stage with little difficulty, making it useless for them. In other words, the only people who would know to use the anchor on World 5 are aware of the glitch in advance and are implicitly proficient at the game to avoid needing it in the first place. While this glitch was resolved in future editions of the game, another one persisted. In the rare event that a Hammer Brother and an N-Mark Spade Panel occupied the same space, they would get stuck together, continuously moving around the map. 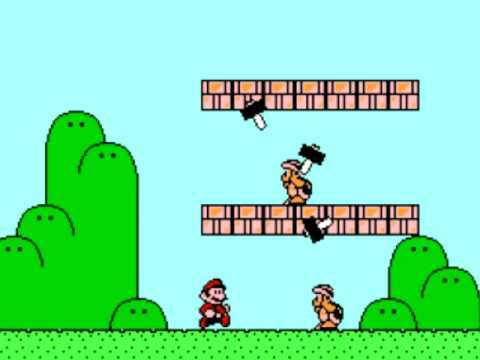 Though it’s not as common of a scenario, as it involves two Hammer Brothers in the same relative area in addition to the player passing the 80,000-point threshold at the exact right time, it still causes the player to lose the game through no fault of their own. Though these glitches may seem like deal-breakers, it’s actually more of a miracle the game turned out as well as it did given the severe hardware limitations Mr. Tezuka and his team worked with. One of my favorite aspects of Super Mario Bros. 3 is that it’s one of the earliest mainstream titles to bear a personal, auteur touch. Chain Chomps are enemies encountered as early as Desert Hill. These creatures are attached to a block and resemble mobile ball-and-chains. They roam their ground for a few seconds before lunging at Mario. Naturally, they cannot hit him if he is beyond their reach. These creatures were inspired by a childhood memory of series creator Shigeru Miyamoto in which he was chased by a dog. Luckily for him, said dog was on a leash attached to a stake – similar to how Mario can avoid the Chain Chomp if he is out of its reach. One shouldn’t grow complacent around them because if enough time passes, they will break free from their leash and begin chasing Mario. 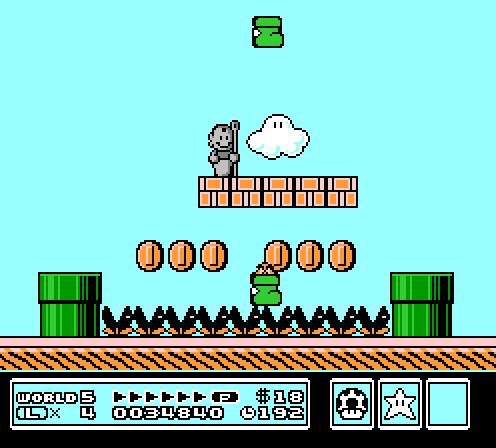 Super Mario Bros. 3 saw the debut of another famous enemy: the Boo. These ghostlike enemies refuse to budge if Mario is looking in their direction. The instant he turns his back on them, they begin flying toward him. Mr. Miyamoto was inspired to create this peculiar enemy behavior by the wife of game director Takashi Tezuka. She was a shy person most of the time except for one memorable instance in which she got angry at her husband when he came home late from work. I also enjoy how parts of Japanese culture influenced the game design. The most obvious aspect lies in the Super Leaf. This is based on the tanuki, or the Japanese raccoon dogs. In folklore, the tanuki would place leaves on their head to shapeshift. They are generally good-natured in these stories, though not above causing chaos. As a further reference to the myths, Mario can potentially acquire a Tanooki Suit. This is an upgraded form of Raccoon Mario that has all of the same abilities thereof in addition to a new one. By holding down on the direction pad and the “B” button at the same time, he will turn into a statue. In this state, Mario obviously cannot move, but in exchange, he is invulnerable. He can defeat several enemies should he active the form in midair. The statue itself resembles Kṣitigarbha, a prominent figure in Buddhism who is known as the protector of travelers and the guardian of souls. In Japan, he is known as Daigan Jizō Bosatsu. Mr. Miyamoto stated in an excerpt from the Super Mario History Booklet released to celebrate the series’ twenty-fifth anniversary that while he thought players outside of Japan would be confused, he left it in because he was too excited to consider removing it. By creating worlds with such disparate elements, none of these facets seem out of place. Extremely lucky or markedly observant players will have stumbled upon another piece of Japanese culture in the form of the treasure ships. They appear if the player meets a series of complex conditions in Grass Land, Ocean Side, The Sky, or Iced Land with at least Hammer Brother remaining on the map. The player must finish a stage possessing a coin total that ends in a multiple of eleven while the tens digit of their score matches said number. 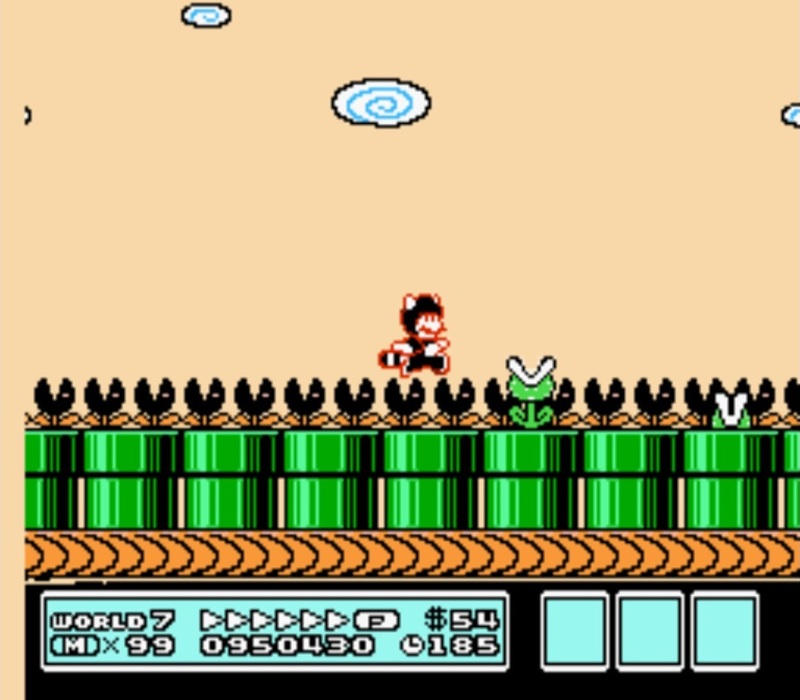 Because of this, the player usually has to make sure they complete a stage with an even number of seconds remaining – as each one awards them with fifty points. Once all of these conditions are fulfilled, the Hammer Brother wandering the map will turn into a treasure ship. True to its name, these airships contain several coins, no enemies, and a hidden 1-up mushroom near the end. For good measure, Mario can fight the Hammer Brother at the end and collect its item. Those versed in Japanese will notice that the symbol on the ship’s mast bears a kanji. This is the word for treasure in Japanese – “takara”. It is, in turn, is an allusion to the takarabune. The vessel is piloted by the Seven Lucky Gods during the first three days of the New Year. The gods are said to carry many mythical items such as a hat that turns its wearer invisible, a magical mallet, and rolls of brocade. As such, pictures of the ship are often displayed during Oshōgatsu – the Japanese New Year. Given the shared characters between languages, it could also be read as a reference to the bǎochuán – Chinese treasure ships. They were a type of large ship under the command of the legendary admiral Zheng He as he embarked on seven expeditions during the Ming Dynasty in the early fifteenth century. On top of this, when Super Mario Bros. 3 was exported, the man in charge of localization added a Western flair to the proceedings. During the third generation of console gaming, there were no localization teams. Instead, it was up to product analyst Dayvv Brooks to take the poorly translated text and smooth it out. Before getting a job at Nintendo, Mr. Brooks worked for Tower Records and had years of experience as a DJ. Music was a very important part of his life, for he had amassed an impressive record collection. It should be noted that in the original Japanese version, the Koopalings are unnamed, which seems curious when one considers their unique designs. Because of this, when he saw the seven Koopalings, he immediately drew upon his experiences. Observing the hairstyle of one Koopaling, he was reminded of the classical composer, Ludwig von Beethoven, hence Ludwig von Koopa. Next was the one who wore sunglasses. As the famous rock musician Roy Orbison frequently donned a similar pair, Roy Koopa was the chosen name. Because many of the Koopalings had hairstyles reminiscent of the influential punk movement, Mr. Brooks decided on Wendy O. Koopa and Iggy Koopa – named after Wendy O. Williams of the Plasmatics and Iggy Pop of the Stooges respectively. The one who looked like a loudmouth was dubbed Morton Koopa Jr. after the talk show host Morton Downey Jr. The sixth was simply named Larry Koopa. He was the exception to this thematic nomenclature, merely striking Mr. Brooks as a Larry. For his boss fight, the final Koopaling balances himself atop a ball. This made Mr. Brooks think of him as the type of character who would do his own thing, not caring in the slightest what anyone else thought – not unlike famed metal musician Lemmy Kilmister of Motörhead fame. Believing it to be a perfect name for a video game character, he named the seventh Koopaling Lemmy Koopa. It’s a true testament to the artists’ talent that Mr. Brooks was able to come up with such fitting names for these characters simply by looking at them. The amount of attention that went into its localization seemed to make Super Mario Bros. 3 a product of both cultures and the result is something few other mediums could replicate. One final quality of Super Mario Bros. 3 I admire is that even with its threadbare plot, it manages to experiment with its own conventions. Peach goes back to a supporting role after being a playable character. Even so, she manages to prove immensely helpful to Mario’s quest by sending him helpful items in the mail. In fact, much like how Super Mario Bros. 2, Super Mario Bros. 3 has a plot twist of its own. Though not quite as astonishing as the game turning out to be a dream, it ultimately turns out that Bowser sent the Koopalings to the seven kingdoms in an effort to distract Mario. While he was busy, he kidnapped Peach and taunts Mario with a letter. Though not exactly cerebral, it does manage to be surprisingly shocking the first time around. Nonetheless, Mario must journey to Bowser’s Castle and rescue Peach. What I like about the eighth world is how much different it is from any of the ones that preceded it. You get the sense that Mario is battling Bowser’s military forces on their own turf, and you cannot afford to make any glaring mistakes. Standing in his way are battalions of tanks, airships, and battleships, and Mario or Luigi, standing alone, must confront every single one head-on. His reward for surviving the first wave is a shot at completing what this world considers Level 1. This subtle touch lets players know that all of the daunting tasks they had fulfilled was only practice and the real battle isn’t over yet. To further cement the feeling of isolation and uncertainty, there is not a single Toad House, Spade Panel, or any friendly NPC to be found. Rarely did games from the eighties succeed on being this tense, but Mr. Tezuka and his team found a way. Though the ending amounts to a single box of text, it is immensely satisfying knowing you well and truly earned it. When the medium’s first enthusiasts matured into adulthood, the eighties became something of a sacred cow. They commonly saw it as the time in which the medium was at its purest. Developers were focused on selling their games as games. They didn’t concern themselves with plot, style, presentation, or any other factor that wasn’t in service to the gameplay. Moreover, because of the graphical capabilities and lower budget constraints of most games at the time, teams were generally much more prolific than they would be in the following decades. However, as much as I can appreciate a game that does not suffer from an identity crisis, I’m not as quick to crown the eighties the medium’s best decade. I am absolutely not questioning its importance, but in practice, I feel it was to gaming what the fifties was to rock music – a vital, formative decade, but a far cry from its pinnacle. The reason I say this is because, when I’ve looked over the most innovative games released in the eighties with a fine-toothed comb, my conclusion is almost always the same. I acknowledge those games’ importance to the medium’s evolution, but rarely, if ever, am I able to recommend playing through any of them. Super Mario Bros. 3 is notable for being one of the very few exceptions I can think of to this trend, for it has held up incredibly well over the years. Part of the reason why I can say this is because it’s actually a lot like The Legend of Zelda. Its sequels could claim to be solid efforts in their own right, but none of them rendered Super Mario Bros. 3 a redundant effort, still managing to provide a unique experience all these years later. If Super Mario Bros. told would-be developers what a platforming game is, Super Mario Bros. 3 showed them how they should be made from that point onwards. It may not have moved as many units or be as immediately recognizable as the game that started it all, but it is, without question, the superior title. In fact, even taking into account the rapid amount of evolution the medium was undergoing at the time, it’s amazing to think that Super Mario Bros. 3 saw the light of day a mere three years after Super Mario Bros. The controls show a degree of polish not present in any other game at the time – it was as though the team could see into the future. It also succeeds to an even greater extent than any of its predecessors by reaching an excellent middle ground between the friendly, welcoming ethos of Super Mario Bros. and the challenging nature of The Lost Levels. It is for these reasons I can say that Super Mario Bros. 3 stands as one of the best games of the eighties, and a playthrough of it is recommended for enthusiasts both old and new. A true classic, though I’ve always been in favor of Super Mario World. Being able to save, repayable levels, multiple exits, secrets up the wazoo, Yoshi! It’s still one of my all-time favorites. With that said, SMB3 is still easy to love, and it probably had the biggest influence on the nature of the series going forward. Great review as always, though I only skimmed it at the moment and will read it in its entirety later. You know, for the longest time, I was debating with myself as to whether Super Mario Bros. 3 or Super Mario World is better. I’ll explain more when I review Super Mario World next month, but my opinion of the two games is that Super Mario Bros. 3 is a better multiplayer game whereas Super Mario World provides the better single-player campaign. However, keeping consistent with my own metrics, Super Mario World wins by a slim margin because I tend to base my judgements off a game’s single-player campaign with me typically considering multiplayer a bonus mode. It’s splitting hairs, though, because Super Mario Bros. 3 is indeed a true classic along with Super Mario World; “Which one should I play?” should never be a question anyone should ask (and if it is, the only appropriate answer is “Yes”). 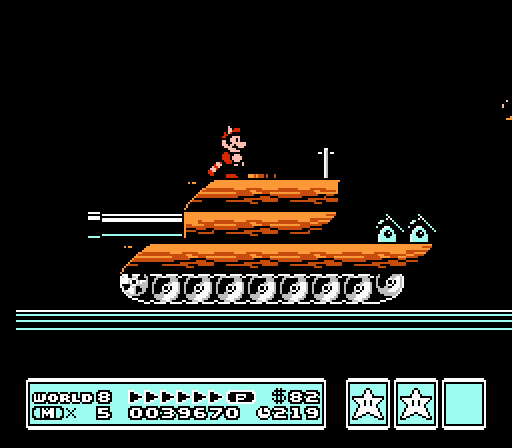 I’m a huge fan of Super Mario Bros 3 for two reasons- the Koopalings and the final stage(s) involving the tanks and how novel it was. Mechanically, the game is fantastic and I’ve gone back to play it plenty. It will never beat out Super Mario Bros 2 in my heart, but it did a lot of great things and added so much to the Mario universe that it’s tough to deny why it’s a classic. The Koopalings are something else, alright. As are those final stages in Bowser’s domain. They really upped the ante from the original wherein the final world looked more or less exactly the same as the first. Going up against those war vehicles really makes the final leg of the journey hit home. Thanks! I wasn’t expecting it to go on this long, and I’m glad you liked it. That’s interesting there’s no save function because on the SNES version I had, you could save the game every two or three stages. very handy for restarting the game where you left off and not having to go through it all again from the start. Yes, the original version lacked a save feature. Even I hadn’t played it before, I would’ve been able to tell because in the All-Stars version, the save feature sends you back to the beginning of the world – albeit with any locked doors remaining open. That was very clearly a save function implemented in a game that didn’t originally have it. I never had this game on my NES, but I do recall the huge jump in quality of the graphics of the first two games on the SNES. It’s always shocking to think this game exists on the same console as the first Super Mario Bros., even when you take into consideration how it boosts the system’s power via the cartridge. It’s a stunning evolution! As usual, this was an amazing and interesting read that dove into all details of this wonderful game and also pointed out the few issues it has. Congrats on the work! I would say when you compare it to practically any other game on the NES, it really stands out in the best way possible. It was as though the team could see into the future. Considering that the Japanese Super Mario Bros. 2 was just more of the same, albeit more difficult, Super Mario Bros. 3 is quite an anomaly. It really shows how talented that team was (and still is). Thank you! I wasn’t expecting this review to go on for that long. I’m glad you enjoyed reading it! It does indeed stand above all other NES games. I know the constant debate is SMB3 vs. SMW but for me 3 always wins out. I think overall the level design and challenge of the game is better in 3 than W. In fact, I think W2 is actually better than W but that is a discussion for another day. Honestly, between those two games, I don’t think one’s really objectively better than the other. Both are excellent games and I can agree that Super Mario Bros. 3 is better than Super Mario World in some respects. I myself lean a little bit more towards World, but it is a very close call. I actually agree that Yoshi’s Island is better than either game, though. I wouldn’t go so far as to say Yoshi’s Island is better than 3 but… to each their own. The Wizard has many factual errors? Are you suggesting that the Power Glove isn’t as great as the movie suggested? This is easily my favorite 2D Mario title. Very fun read! Thanks! I’m glad you enjoyed it. Super Mario Bros. 3 really is something special. Super Mario Bros. 3 is my favorite NES game, bar none. It was just so well designed, and there always seems to be new things to find in there. It is such a great way of advancing from the original and making something different, while still being recognizably built off of the original. Even my parents, who didn’t care about video games, got in on this one. I remember plenty of time sharing the secrets, tips and tricks we found together. Was really good times. Yeah, it’s a solid choice. The only other NES game I think is in the same league is Mega Man II, but I’d say Super Mario Bros. 3 is better. For that matter, I’d go as far as calling it the single best games of the eighties by virtue of having aged beautifully. I didn’t think much of it at the time, but I can hardly believe it came out only three years after the original. It’s as though they saw into the future. Funnily, I remember my own parents liking this game as well. On that note, my brother and I would play it all the time. We’d constantly enter battle mode just to mess with each other; it was hilarious every single time. In fact, we were playing it together when I cleared it for the first time. It’s definitely one of my favorite gaming memories.